It sounded great, I’m sure. But it was still the phoniest piece of baloney, given what he and Romney have actually proposed to do if elected. Let's start with the budget that Ryan crafted earlier this year and which House Republicans approved. It would dramatically cut spending on domestic programs—taking a huge, $3.3 trillion bite out of programs that target low-income Americans. At the same time, it would give new tax cuts to the rich. 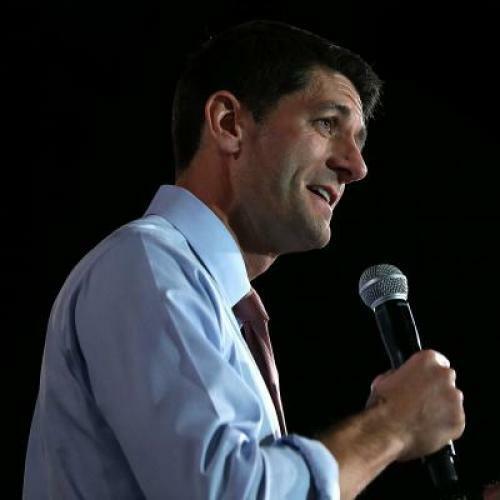 Romney has said he would sign something like Ryan's budget if it ever came to his desk. And while Romney been a lot less specific about the proposals he'd put forward, he’s made a few specific commitments, like vowing to cap non-defense spending at 16 percent of gross domestic product and promising Ryan-like changes to food stamps and Medicaid. Taken together, these suggest a budget plan with a similarly severe impact on low-income programs. And "severe" is not an overstatement. Just this week, the Kaiser Family Foundation updated a previous estimate of Ryan’s proposed reduction in spending on Medicaid. The report’s authors, all of them researchers at the Urban Institute, concluded that between 14 and 20 million people could lose Medicaid coverage—unless states made up for the lost funding on their own (which would be unlikely, particularly for more conservative states) or decided to make some of the cuts by reducing coverage for the disabled and elderly (which would simply distribute the pain differently). That’s not all. A Center on Budget and Policy Priorities analysis suggested as many as 8 million people on food stamps could lose benefits under Ryan's proposed cuts to the Supplemental Nutrition Assistance Program (SNAP). In case you were wondering, 85 percent of SNAP recipients have incomes below the poverty line and 40 percent of them have incomes that are less than half the poverty line. Does the presence of such programs really make a difference in people’s lives? You bet it does. Last year, according to the Center on Budget, food stamps alone kept about 4 million people out of poverty, half of them children. Romney and Ryan claim that, like the old welfare system, today’s low-income programs encourage dependency. That seems overstated. The research I’ve seen suggests that programs “behavioral effects” are small relative to their negative impact on poverty. But even if Romney and Ryan are right, that’s an argument for redesigning the programs—not for defunding them. In the speech, Ryan went out of his way to note that Romney had, over the course of a lifetime, been personally generous to people around him and those he perceived to be in need. The two of them have done a lot of that lately—talking about acts of charity as proof they care about the poor. I'm perfectly willing to believe that's true. I also think it's irrelevant. As president and vice-president, their actions would affect tens of millions of low-income Americans. If those people lose the supports on which they depend, Romney and Ryan's intentions won't matter a thing.